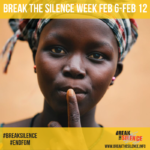 Break The Silence Week (Feb 6th to 12th) is a week dedicated to raising awareness and driving action to end end female genital mutilation (FGM). 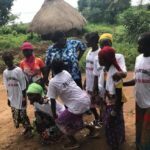 It is a fun week with a serious message, a week when people “activate” to shine a spotlight on FGM. 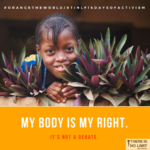 Throughout this past week, we’ve engaged with activists and organizations worldwide that are working tirelessly with a common goal to end FGM by 2030. Here is a highlight of some of the individuals and organizations. 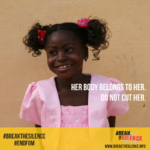 Today is International Day of Zero Tolerance for Female Genital Mutilation, and cofounder Aissata M.B. Camara spoke at the opening of FGM: 68 Million Girls At Risk Exhibition, a photography display that sheds the light on this harmful practice in collaboration with United Nations Population Fund (UNFPA) and United Nations International Children Emergency Fund (UNICEF), and cohosted by Dysturb. NEW YORK, FEBRUARY 6, 2019—There Is No Limit Foundation Co-Founders, Aissata M.B. 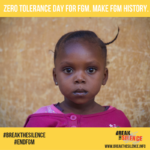 Camara, and Mariama Petrolawicz, marked the International Day of Zero Tolerance for Female Genital Mutilation today, by announcing the start of the second annual Break The Silence Week, a week dedicated to raising awareness and driving action to end FGM. Happy Day of the Girl! Happy Day of the Girl! During my trip to Guinea, I had the opportunity to interact with many girls. We spoke about their goals, visions, and fears. 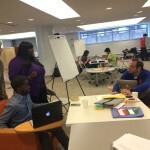 Aissata Camara, an NYU Wagner alumni and co-founder of the There is No Limit Foundation explained to participants at the hackathon that SMS was the best technology to use. "When there is a problem many peoples' first instinct at these events is to create an app," she said. "I was able to give [participants] the cultural context so they could understand [that] certain things wouldn’t work. I helped them realize the best technology is SMS technology." On Saturday, November 1st and Sunday, November 2nd, 2014, There Is No Limit Foundation partnered with the Greene House and Design Tinkering Club at the New York University Polytechnic School of Engineering (NYU Poly) to gather technologists, makers, hackers, designers, activists, and medical experts to work on implementable solutions to address the Ebola outbreak currently in Guinea, Liberia, Sierra Leone and threatening the rest of the world. 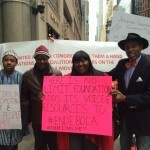 On October 24th, 2014, There Is No Limit Foundation co-sponsored the first walk in NYC to fight against ebola in collaboration with the West African Ebola Task Team led by the United African Congress (UAC) and Give Them A Hand Foundation. Our Co-Founder and Executive Vice President, Aissata M.B. 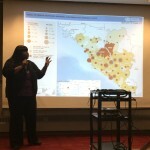 Camara message to the crowd of attendees was clear:"Ebola is a global problem that requires a global solution. Let's fight to end ebola so we can go back to promoting the security and dignity of people."